At its most basic, solar power works when the sun’s energy is converted into usable electrical energy for use in powering, homes, businesses, industries, schools, utilities and more. At Home Solar Panels Melbourne we have the knowledge, expertise and products to meet all of your solar energy needs. We take the time to explain what solar energy is and how it can help you, we go through the process and identify the best solar system for you; our experts install everything safely and efficiently for you, and we take care of all the paperwork and necessary agreements to get you connected to the grid immediately.Let’s learn more about how solar power specifically works in your home. Knowing how home solar power systems could in your home may help you decide whether or not your home is a good candidate for solar power, as well as why it’s a great investment for your finances and for the environment. Our guide to solar information will arm you with all the basic solar facts including the advantages of going solar. Solar panels are placed on your roof in the best configuration to access the most sun as possible. Generally, south, east and west facing roofs make for the best solar panel placement. These panels are made up of photovoltaic cells that generate direct current (DCs) from the sun during daylight hours, even if it’s cloudy. The solar panels are connected to a solar inverter which has been installed in your home. The solar inverter converts the DCs into alternate current or ACs so that they can be used a solar power. They need to be converted to ACs before the grid can use them as electricity. The solar panels and inverter allow you to generate electricity with which to power your home. AN interesting solar fact is that our solar power system can help you reduce your electricity bill by almost 80%. Many people are able to completely eliminate their electric bill. Any additional electricity your system generates can be fed back to the grid for monetary feed-in-tariffs from your state government. Why Solar is Becoming So Popular? In addition to saving you money and having an endless supply, solar energy does not harm the environment. 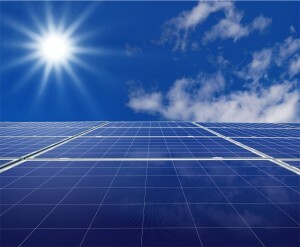 Solar energy is one of the few clean sources of energy. No fossil fuels have to be extracted from the earth to generate solar power and no greenhouse gasses are emitted in the conversion of the sun’s energy into usable electric energy. Now is the time to convert your electrical power to solar power, by doing so you can help protect the environment and your family’s financial future. 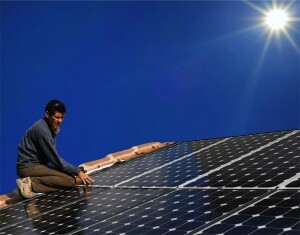 At Home Solar Panels Melbourne we take the time to explain the process and to discover which solar energy system is best for you; our experts install everything safely and efficiently for you, and we take care of all the paperwork and necessary agreements to get you connected to the grid immediately. We have some of the best solar energy offers and deals in Melbourne, Victoria. Are you ready for solar panels now? Simply call us today and we’ll let you know in less than 2 minutes if you qualify for our no deposit, no interest solar panels deal. But hurry, you need to call right now – this deal won’t be available for long.